Of all the tactics in an email marketer’s toolbox, few are as powerful as the little word “SALE!”, especially when paired with the warning “Hurry, time’s running out!” But, similar to antibiotics or thrill-seeking, promotional discounts and other limited-time offers lose their impact when overused. Like the villagers in the boy who cried wolf, consumers become inured to senders who promote constant sales and make every email a last chance to save… and then do it again… and again. What’s going on here? It’s not that consumers don’t like the notion of a deal. Sales, coupons, and other discounts are powerful psychological motivators for most of us. Moreover, although discounts necessarily require careful management of operating margins, value-based pricing can be a very successful long-term strategy. As businesses as diverse as Target, Trader Joe’s, and many others can attest. On the other end of the spectrum, some retailers (especially high-end, luxury brands) simply never discount, instead relying on brand cachet and other qualities to nurture their business. What unifies these otherwise very different retailers is a consistent pricing strategy that doesn’t depend upon temporary promotions to draw customers. For retailers whose brands and business models don’t have that intrinsic pricing strategy—high or low—consumers’ expectations create a quandary. Retailers turn to promotional pricing to goose sales, but when overused, customers quickly become trained to shop only during sale periods. A dependence on sales to generate business has become especially intractable for mid-market brands like Gap, Lands’ End, and Macy’s. I’m not the only person who thinks if I’m not getting 40% off at these stores, I’m throwing away money. It’s vicious cycle that can be difficult to escape, as J.C. Penney learned the hard way. As email marketers, we can’t solve that fundamental challenge by ourselves. But that’s not to say we don’t have a role in addressing the “cry wolf” dynamic. Of course, how we approach it depends on the nature of our business and our brand. I’ve seen great examples of using time sensitive email that don’t feed the wolf as we seek to drive traffic. Here are some lessons email marketers can take to heart. Make sales and other promotional discounting a genuinely rare event. For example, men’s clothing retailer Thomas Pink has two sales per year, and they’re explicitly designed to clear inventory of goods with seasonal appeal. Your customers might well jump at the deals — great! However, they won’t be tempted to delay purchases at other times, because they know that your rack rates are the “real” prices. Restrict aggressive “time-sensitive offers” to situations where it has the most impact and supports a strategic business goal, rather than a one-time spike in traffic. Encouraging sign-ups for products or services with subscription pricing—which drives recurring revenue—is an ideal application of this approach. 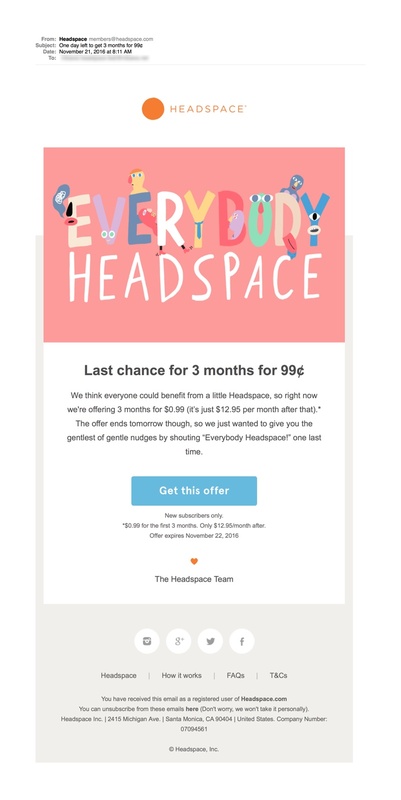 A perfect example is this email from Headspace that offered limited-time incentives to get new subscribers. It delivers a compelling value proposition for the customer, with little real cost to the company’s brand or business model. 3. Get time on your side by using creative, time-based promotions that don’t involve sales or promotional pricing. 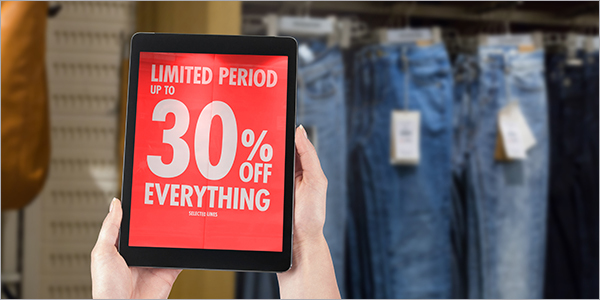 Unlike endless “the sale ends at midnight!” offers (which seemingly happen every week), effective time/event-based marketing creates a sense of real value and novelty. Consider this email from Peet’s Coffee. The real appeal is the in-store demonstration; although it includes a 20% discount, that sale reinforces the specialness of the event, rather than a pure pricing play. I won’t pretend that rethinking time sensitive email offers like these are all it will take to solve the promotional pricing trap that too many business find themselves. But I do hope they show that, when used judiciously, time can be on our side and serve as a powerful marketing tool that our customers will truly value. What’s been your experience sending or receiving limited-time offers in email? I’d like to hear what’s working for you. P.S. Have you seen examples of time sensitive email sales we’re missing? Please comment below!